Place the peanut butter, honey, and milk in a sauce pan. Slowly warm over low heat. Add the protein powder and cinnamon and stir until completely blended. Add the uncooked oats. Warm the mixture just enough so that it's easy to stir. You don't want to cook it. If the mixture's too thick, add milk. Press the batter into a 10" x 12" pan. Spray the pan with PAM cooking spray to avoid having the bars from sticking to the sides. 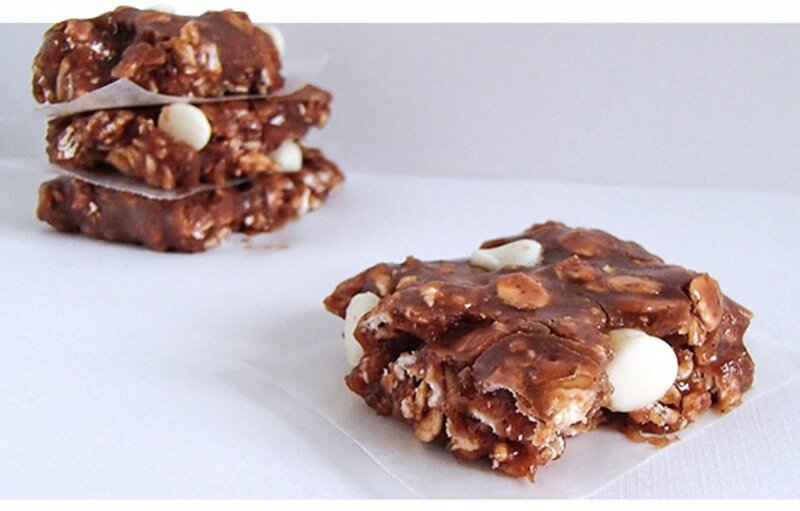 Sprinkle yogurt chips over the top and press them into bars. Leave the bars out to cool. Once they're completely cooled, cut into 12-16 individual bars. Wrap each bar in plastic wrap to be stored. The bars can be refrigerated but taste best at room temperature.